UPDATE (12/27/04): Each projection has been rated, with or without final comments, at the bottom of each presentation. Due to the revelation that the US nearly went to war with North Korea on the date I projected, March 2003, and that this was kept secret from the American public, this becomes a PREDICTION AVERTED which has the same value as a PREDICTION FULFILLED when proven. Also, although 22 months late, a very rare form of earthquake - a "great" earthquake - struck Indonesia, generating a massive tsunami that has spread throughout South Asia, all exactly as predicted. This, along with two large destructive Indonesia quakes in February, although not "great," has created a PREDICTION OVERKILL situation. Thus, the "final" base 7 accuracy rate, based on all four 2003 pages' ratings, along with the celebrity page rating, is boosted from 72.0% to 73.5%. It remains possible that some failed and partially successful projected events may yet be fulfilled before the end of the year. If that occurs, the rate will go up. Again, I must emphasise that it is my base 7 system of prediction that is being rated -- not my interpretations of Nostradamus, the Bible, Edgar Cayce, or any other prophet. Death toll surpasses 155,000; thousands still missing - January 3, 2005. Tsunami death toll tops 116,000 -- Relief workers find devastation in Indonesia - December 30, 2004. Quake, tsunamis kill more than 22,000 -- Thousands still missing as search for survivors continues - December 28, 2004. Asia quake death toll tops 20,000 - December 27, 2004. Accuracy rating for 2003 has been boosted to 73.5%. See above. December 27, 2004. Asia quake death toll over 11,000 -- Largest earthquake in 40 years measured 9.0, triggered massive tsunamis - December 27, 2004. PREDICTION FULFILLED. Comments included. Arab blood covers the Adriatic Sea. NEW PREDICTION: 1/26/02 -- The last time the Black Sea port city of Trabzon was in the news was in January 1996. 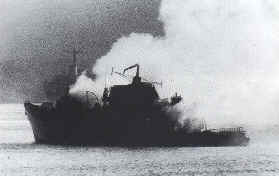 A band of Chechen and pro-Chechen Turkish rebels hijacked a Turkish ferry harboured at Trabzond in retaliation for a Russian offensive in Dagestan. The Russians razed an entire village being used by Chechen guerrillas to the ground. The gunmen eventually gave up to Turkish authorities near the Bosporus Strait. Seven years later, in January 2003, I believe something far more serious will occur in this part of northeastern Turkey. As described by Nostradamus above, Iranian forces will conquer and occupy Trabzon. Although the war between Turkey and Iran has yet to begin, and did not begin as projected in September 2001, I believe it will sometime in 2002 (unless January 2003 is the actual start). It makes no sense to apply this event to 2010 -- World War III will be well over by that time. Line 4 is likely about a force comprised of Al Qaeda forces that will be sent to the Balkans to aid rebel Albanians and/or Bosniaks sometime this year. It appears that just before or during the Iranian attack on Trabzon, they will suffer a terrible defeat at the hand of the anti-terror coalition led by the United States. NOTES: I should start out by saying that, as far as my base 7 system was concerned, there was only a 14.3% chance of anything like this even happening. In terms of real odds, it was probably closer to a 0.02% chance. Nevertheless, the prophecies of war between Iran and Turkey and Russia and Turkey are many by diverse prophets down the ages. Even with the odds as low as they were, I felt an obligation to project such an event. After all, I have seen other predictions with just as low odds come true in past years. If we are living in the times when such a conflict could happen, I would not be surprised to see it happen before 2008 or certainly, in all practicality, within the next 40 years. The shelf life of this prediction, as with all predictions made for 2003, continues until midnight December 31, 2004 (in the event of an adjacent fulfillment). NEW PREDICTION: 9/13/02 -- I already mentioned this prediction a few months ago on my Email Forum, but will post it now. 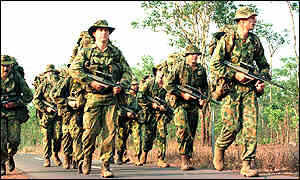 I sense some sort of mass mobilisation of Australian troops abroad in January 2003. Most people believe this will be against Iraq, but I am not certain. It could be Iraq or it could be somewhere else -- possibly this will be against Al Qaeda forces in the Philippines, Malaysia, and Indonesia or against China in the Taiwan straits and the Spratleys. CANBERRA, Australia (CNN) -- Australian special forces are now operating inside Iraq gathering details on Iraqi troop movements and military targets, Australia's defense department says. "Our special forces task group has transitioned from the battle-preparation phase ... and is now undertaking active operations inside Iraq," Brigadier Mike Hannan told a news conference in Canberra on Friday. "The [operations] would include long-range reconnaissance and surveillance operations where they would be seeking detailed information on such things as enemy troop movements, identifying targets such as key military ops and so on," Hannan said. Australia has committed 150 Special Air Services troops in addition to combat jets, warships and around 1,900 other soldiers, to the U.S.-led attack on Iraq, in what the Australian military have dubbed Operation Falconer. 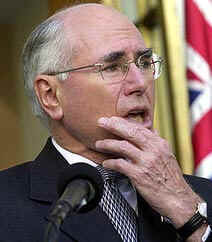 Australian Prime Minister John Howard confirmed to radio audiences Friday morning the nation's forces had been involved in action against Iraq from the start of the war on Thursday. "Last night, I spoke by telephone to Brigadier McNarn, who's the Australian Commander in the [Persian] Gulf, and he reported that all of our men and women were in good spirits, their morale was very high," Howard said. Brigadier Hannan said no Australian forces had been injured in the first phase of the war. He said Australia's F/A-18 Hornets were flying combat and combat-support operations, providing protection for coalition aircraft against any possible air threats. "These are demanding missions, and they've seen our aircraft flying well into Iraqi territory," Reuters reports Hannan as saying. He said the Australian navy was boarding dhows (sailing boats) in the Gulf in the hunt for any escaping Iraqi officials or anyone planting explosives in the harbors and shipping lanes. "At this point of the operation, our ships are less concerned about contraband than they are with the movement of people who may wish to leave and who we may which to detain, or with the use of the dhows as part of a mining campaign in these narrow waterways," Hannan said. Australia's government has staunchly supported U.S. President George W. Bush's hard line against Iraq and deployed troops to the Persian Gulf in January in preparation for the war, despite strong public opposition to an attack on Iraq without U.N. approval. 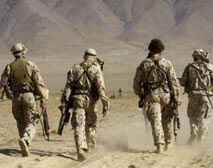 Australian forces also contributed to the U.S.-led war in Afghanistan. COMMENT (3/22/03): This prediction is unquestionably FULFILLED. NEW PREDICTION: 1/23/03 -- After a lull in major seismic activity, it is now clear that the Solomon Islands and Mexico quakes are the leading edge of a swarm of earthquakes that will plague the world throughout the year. These five regions, Egypt, Eastern Canada, Ecuador/Peru, India, and southern France (especially around the Pyrenees mountain chain) may all experience major temblors beginning with this month, January 2003, and throughout the next four months up to the alleged Planet X event in May 2003. Each country named is a separate prediction, but space does not permit separate presentations for each. Note that a Pyrenees mountains quake could also, theoretically, place Spain at risk. NANCY, France (AP) - A magnitude 5.4 earthquake shook eastern France late Saturday, according to the World Physics Institute in eastern Strasbourg. There were no immediate reports of injuries or damage. The tremor, which lasted about eight seconds, was felt around 9:40 p.m. local time (2040 GMT). Several shorter and weaker tremors followed, startling residents in the cities of Nancy, Saint-Die and Luneville. The tremor was lightly felt in parts of Paris. LIMA, Peru, May 28 (Reuters) - A strong earthquake jarred the Peruvian capital, Lima, at 4:26 p.m. local time (5:26 p.m. EDT/2126 GMT) on Wednesday, rattling buildings across the sprawling city of 8 million people. 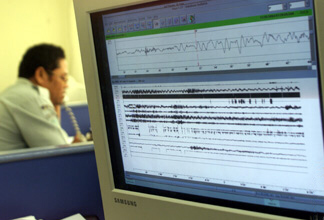 The quake measured 5.1 on the Richter scale, an official at Peru's National Geophysical Institute told RPP radio. Its epicenter was 31 miles (51 km) under the Pacific Ocean, 29 miles (48 km) west of the coastal city of Chilca, it added. No reports of damages were immediately available. The national police said no injuries had been yet registered. Earthquakes of 5.1 magnitude on the Richter scale are capable of causing serious damage in populated areas. CAIRO, June 4 (Reuters) - An earthquake measuring five on the open-ended Richter scale shook an area near Sohag, about 400 km (250 miles) south of the Egyptian capital on Wednesday, Egypt's official Middle East News Agency reported. Local officials said there were no immediate reports of injuries or damage. They said the earthquake was concentrated in a sparsely populated mountain area outside Sohag in central Egypt. Egypt experiences periodic earthquake activity, and in 1992 a quake measuring 5.2 on the Richter scale killed more than 500 people. Earthquake shakes Mideast -- Medium to strong earthquake rattles Mideastern countries causing minor injuries, damage from Cairo to Amman - February 11, 2004. NOTES: Each quake listed was a seperate prediction. The quake in southeastern France was quite rare and there have been no others since February 22, 2003 at this writing (July 8, 2004). Likewise, the quake in Egypt on June 4, 2003 was also rare and, save for a more general earthquake that shook a number of Middle East nations including Egypt in February 2004, remains the only temblor to strike Egypt exclusively in a very long time. Earthquake in Peru are a bit more common, but the one above happened around the time I specified. India and Eastern Canada still have not seen any seismic activity. RATINGS: +1.0, +1.0, +1.0, 0, and 0. NEW PREDICTION: 8/24/02 -- This is an either or situation, I think. I find it highly unlikely that both events will occur around the same time (but I suppose anything is possible). However, one could occur early in the year and the other in December. read on. Potential event one: The US will deploy its navy to the waters of Central or South America. It seems to me that it will likely be in reaction to the problem of terrorists being allowed to use certain countries in Central or South America as a base of operations against America. This may be pre-emptive in nature, to stop a developing problem from getting worse. It is also possible an event may provoke such an attack -- like the kidnapping of US tourists or a US embassy that is taken over and Americans held hostage. The nations involved I am uncertain about. It is possible the US may get assistance from the British. This will take place in either April 2003 or December 2003. Potential event two: This may have already happened prematurely in July 2002 when Spain and Morocco came close to going to war over islands near Gibralter. If so, then this scenario is already doomed to fail in 2003 (too bad too, I was going to post this prediction a few months ago and would have gotten credit for the Spain-Moroccan mess). In any event, it is possible that the conflict between the two will re-materialise. Look also instead to a possible conflict over islands in the Aegean or the island of Cyprus between Turkey and Greece or islands in dispute between Libya and Italy. The base 7 dating for this event is January 2003 or April 2003. PORT-AU-PRINCE, Haiti (CNN) -- Two planes carrying approximately 50 U.S. Marines charged with protecting the U.S. Embassy and its staff against possible attack by rebels landed in the Haitian capital Monday. The Marines were requested by the U.S. ambassador to secure the compound as rebels continue to make advances in that country. Pentagon sources said the elite contingent of Marines does not portend a large-scale military intervention in Haiti, but is intended solely to ensure the safety of embassy personnel. The Marines, trained in counterterrorism, would add to a Marine security detachment already based at the embassy. They are part of a Fleet Anti-Terrorism Support Team, known as a FAST team. These troops are trained for missions such as securing the Navy's fleet as well as embassies when security becomes an issue. This past weekend, the U.S. State Department ordered the departure of all family members and non-emergency personnel from the U.S. Embassy in Port-au-Prince. "We decided it is essential to take out nonessential personnel until the situation is more stable," a senior State Department official said. The United States has issued a travel warning telling American citizens it is unsafe to remain in Haiti and to leave while commercial flights are still available. The U.S. Embassy was shut Monday, a spokeswoman said from her home. All staff were urged to remain at home, she said. Meanwhile, Haiti's government sent reinforcements to Cap Haitien after rebels seeking to oust President Jean-Bertrand Aristide moved into the country's second-largest city Sunday, storming police headquarters and freeing prisoners. A government source told CNN the rebels had withdrawn from Cap Haitien by Sunday evening, but witnesses and journalists said gunfire could still be heard around the city. Aristide told a crowd at a celebration in Port-au-Prince that additional police would be sent to Cap Haitien, on the northern coast. 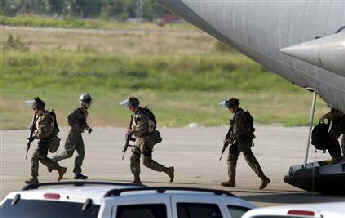 The government source said the reinforcements were on their way Sunday afternoon. With a population of about 500,000, Cap Haitien is the Aristide government's last stronghold in northern Haiti. Walter Eussenius, owner of the Mont Joli Hotel in Cap Haitien, said rebels moved into the city about 10 a.m. Sunday. "The population is terrorized and the city is completely surrounded," Eussenius told CNN in a telephone interview. Machine gun fire could be heard in the background as he spoke. Eussenius said he drove three miles to the airport and was told that rebels had taken over the facility and tried to hijack an airplane. The account backed up a Dominican pilot, who said men armed with machetes boarded a plane in Cap Haitien and forced the pilot to fly to Port-au-Prince. "We called one of our managers from over there who says there was shooting and the airport is closed," said the pilot, Ricardo Faustela. "So right now we are not flying, and we don't know what is happening." 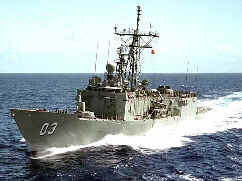 US Mulls Sending Three Warships, Marines to Haiti - February 27, 2004. UPDATE (2/29/04): I consider predicted "event one" to be PARTIALLY FULFILLED -- adjacently, two months late from the December 2003 vector. Thus far, 50 US Marines have been sent to Haiti via plane but not by ship. They are equipped and prepared for military action if needed according to ABC (American Broadcasting Network) television news. The reasons the Marines have been sent comply with my reason: "This may be pre-emptive in nature, to stop a developing problem from getting worse." The US navy has not yet been deployed -- but the Bush administration is considering sending three warships carrying an additional 2,000 marines. The developing situation bears watching and a total fulfillment could still occur. NEW PREDICTION: 1/23/03 -- I have avoided making earthquake predictions for 2003, largely due to the fact that if Planet X, Nibiru, really passes close to earth in May 2003, there will be major earthquakes all over the place. That would make the science of making specific earthquake predictions rather ludicrous. However, the recent quake in Mexico demonstrates that the base 7 system is still working -- this was a repeat of a reportedly severe October 1995 Mexican quake. Unfortunately, I did not know about the 1995 quake. Anyway, February 2003 looks very ominous for the islands of Indonesia. The earthquake that strikes the region will quite possibly be classified as a "great" earthquake (above 8.0). It may generate a rather sizeable tsunami. (CNN) -- Massive tsunamis triggered by the largest earthquake to shake the planet in more than 40 years wiped out coastal areas across Asia as far as 1,600 kilometers (1,000 miles) away, killing more than 11,000 people. More than 4,500 people are reported dead in Sri Lanka, along with thousands more fatalities in Indonesia and India and hundreds dead in Thailand. The initial quake, measuring 9 in magnitude, struck about 160 kilometers (100 miles) off the coast of Indonesia's Sumatra island around 7 a.m. Sunday (0000 GMT), according to the U.S. Geological Survey's National Earthquake Information Center. It is the fourth largest earthquake in recorded history, according to the NEIC. The measurements have been taken since 1899. News agencies in Indonesia reported over 4,000 dead, many of them in Aceh, in northern Sumatra, about 160 kilometers (100 miles) from the quake's epicenter. CNN has been able to confirm only 500 people killed there but that figure is set to soar as communications and access improve to the ravaged region. "We still haven't got any reports from the western coast of Aceh, which is closest to the epicenter, so officials are bracing themselves for a lot more bad news," said journalist John Aglionby in Jakarta. Sri Lankan military authorities are reporting more than 4,500 people killed, most of them in the eastern district of Batticaloa. Several districts in the country's south have still not reported casualty figures, and authorities fear the death toll could rise. Officials said thousands were missing and more than a half million had been displaced. The huge waves also swept away a high security prison in Matara, in southern Sri Lanka, allowing 200 prisoners to escape. Eyewitnesses in the eastern Sri Lankan port city Trincomalee reported waves as high as 12 meters (40 feet), hitting inland as far as a kilometer (half a mile). The Sri Lankan government declared a state of emergency, and along with the government of The Maldives has requested international assistance, the United Nations' Office for the Coordination of Humanitarian Affairs reported. Sri Lankan officials imposed a curfew as night fell, and tourists were being evacuated from the eastern coasts to the capital, Colombo, which is on the west coast and was unaffected. India agreed to assist Sri Lanka, sending two naval ships to the resort town of Galle, in the south, and Trincomalee, according to Colombo officials. Indian aircraft will bring in relief supplies to the country on Monday. India itself is reeling from the aftermath of the quake and tsunamis. 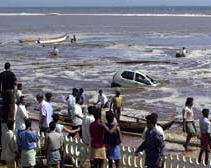 Indian officials said at least 2,300 Indians were killed as a result of the massive waves. A resident of Chennai (formerly Madras) in Tamil Nadu district -- the hardest hit area -- said he witnessed several people being swept away by a tidal wave. Along India's southeastern coast, several villages appeared to have been swept away, and thousands of fishermen -- including 2,000 from the Chennai area alone -- who were out at sea when when the massive waves swept across the waters have not returned. Along the coast, the brick foundations of village homes were all that remained. Official state media said 1,725 people were killed in Tamil Nadu state. At least 300 people died in India's remote Andaman and Nicobar islands, which were closer to the quake's epicenter. Most of the aftershocks have been centered off those islands. A further 700 were missing. Three hundred others were reported to have been killed in other states, with thousands missing, many of them fishermen at sea when the waves hit. Thai authorities say more than 200 are feared dead, and hundreds are missing after the massive waves swept through coastal areas, including Krabi and the popular resort islands of Phuket and Phi Phi. One witness said Phuket's famed Laguna Beach resort area is "completely gone." The area provides 40 percent of Thailand's $10 billion annual tourist income. Among the missing were a number of scuba divers exploring the Emerald Cave off Phuket's coast. Officials say the final toll in Thailand may be closer to 1,000. Phuket's airport -- which closed down when its runways flooded -- reopened, but most roads remained closed, as officials tried to assess the damage, fearing structural damage to buildings closer to the shore. Thai Prime Minister Thaksin Shinawatra arrived in Phuket and said the situation was "under control." He told CNN he planned to stay the night and direct rescue and relief efforts. Eyewitnesses reported people drowning in their hotel rooms near the coast as 30-foot waves washed ashore. Others reported narrow escapes -- including one man whose alert but screaming boat driver turned their boat directly into a nearby shore. As he and his passengers scrambled up the steep beach, the waves crushed their boat. There were also fatalities reported in The Maldvies. However, an accurate death toll has not been assessed because communications to the outlying islands have been cut off. The earthquake is classified as "great" -- the strongest classification given by the NEIC. NEIC geophysicist Don Blakeman said all of the tsunamis were triggered by the initial quake. Waverly Person, Blakeman's colleague at NEIC, said the tsunamis are "long over at this point," and residents and visitors should not be concerned with more high water. One major aftershock, measuring 7.3 in magnitude, struck about 300 kilometers (200 miles) northwest of Banda Aceh -- on Sumatra's northernmost tip -- over four hours after the initial quake, according to the NEIC. The rest of the aftershocks measured under 6.5 in magnitude. The NEIC expects the quake to produce hundreds of smaller aftershocks, under 4.6 magnitude, and thousands smaller than that. "A quake of this size has some pretty serious effects," he said. He explained the quake was the energy released from "a very large rupture in the earth's crust" over 1,000 kilometers (600 miles) long. The rupture created shockwaves that moved the water along at several hundred miles per hour. It was the strongest earthquake to hit since March 1964, when a 9.2 quake struck near Alaska's Prince William Sound. The strongest recorded earthquake registered 9.5 on May 22, 1960, in Chile. 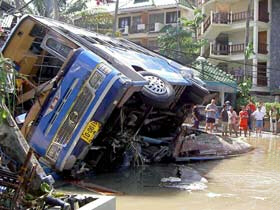 CHENNAI, India (CNN) -- The death toll from Sunday's tsunamis climbed to 20,000 by Monday as fears of disease from decaying bodies and contaminated water grew in Indonesia, India, Sri Lanka and Thailand. The giant waves -- triggered by the most powerful earthquake on Earth in 40 years -- also left thousands injured, thousands missing and hundreds of thousands homeless. A Sri Lankan forecaster warned of a "remote possibility of small tidal waves" caused by aftershocks Monday. Some of the tsunamis reached as far as 1,000 miles from the epicenter of the 9.0 magnitude quake, which was located about 100 miles (160 km) off the coast of Indonesia's Sumatra Island at a depth of about 6.2 miles (10 km). Tsunami death toll tops 116,000 - Relief workers find devastation in Indonesia - December 30, 2004. Quake, tsunamis kill more than 22,000 - Thousands still missing as search for survivors continues - December 28, 2004. COMMENTS (12/26/04): Had this been just another large quake to strike Indonesia, like the 6.9 and 7.4 earthquakes that struck earlier this year in February 2004, I would not be taking credit for predicting it 22 months after the established vector of February 2003. However, today's event so closely matches the prediction I made it must be considered as the PREDICTION FULFILLED. I specified not only the place, "the islands of Indonesia," but also predicted that "the earthquake that strikes the region will quite possibly be classified as a "great" earthquake (above 8.0). It may generate a rather sizeable tsunami." Today's massive shocker, a magnitude 9.0 (certainly above an 8.0), is being classified as a "great" earthquake and the tsunami generated spread outwards to cause massive damage and loss of life in Thaliand, Sri Lanka, and India. This is the only earthquake prediction thus far where I have declared the exact location, a classification of "great," and a destructive tsunami to follow. Because this earthquake is the fourth largest since 1899 and the largest since 1964, it is a very rare event (at least, so far, quakes of this size are). Therefore, being off by 22 months for an event this rare and infrequent, when I have specified everything else about it so exactly, should not render this prediction as failed. Together with the February 2004 quakes this was also PREDICTION OVERKILL. NEW PREDICTION: 1/23/03 -- February 2003 will also be a bad time for China. It will experience one of its worst earthquakes in a long time. Yet, I suspect this will only be a precursor to an even more cataclysmic seismic event to follow this year or next (more on that at a later time). Given that the base 7 earthquake vectors appear to be off by several months, the time of real danger may not come until as late as May or even July. Of course, with the potential for nuclear conflict by that time, the great earthquake could well be a nuclear strike against China and/or North Korea by the US. BEIJING (AP) - A powerful earthquake toppled houses and schools in China's remote western region of Xinjiang on Monday, killing at least 242 people and injuring more than 1,000 others, officials and state media said. The 6.8 magnitude quake struck Bachu County on the western edge of Xinjiang, near China's mountainous border with Kyrgyzstan, at 10:03 a.m. local time, the government said. The U.S. Geological Survey in Golden, Colo., put the quake's magnitude at 6.3. At least 242 people were killed and more than 1,000 injured, the official Xinhua News Agency said, without giving details. It said the quake was the most serious to strike Xinjiang since 1949, when the communist government was founded. More than 1,000 houses and school buildings collapsed in one village in Bachu County, where the earthquake was centered, Xinhua reported. 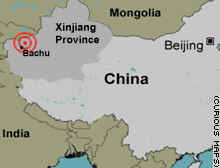 It said tremors were felt in Kashgar, the biggest city in the area, though it didn't give details of any damage there. The area is about 1,750 miles west of Beijing and its inhabitants predominantly Turkic-speaking Muslims. Xinjiang suffers frequent earthquakes, especially its far west, which covers the foothills of Central Asia's soaring Pamir and Tianshan mountains. But they usually cause few injuries and little property damage because it is so sparsely populated. In Bachu County, at least 10 students died when their junior high school collapsed in the county's most badly damaged town, Chongku Qiake, said an official reached by phone at the county government offices. He gave his name as Maimai Qiming, indicating he is a member of one of the region's Muslim ethnic groups. Most of the dead were in collapsed houses where the quake caught them eating breakfast, said an officer reached by telephone at the Bachu County police station. He gave identified himself as Habuduani, another Muslim name. China quake toll rises - February 25, 2003. Dogs hunt for quake survivors - February 26, 2003. COMMENT (2/24/03): Looks like this is a PREDICTION FULFILLED. It also happened dead square in the February vector as I projected. In the year 1670, by the Liturgy [the Council of Nicaea]. NEW PREDICTION: 2/6/02 -- February 2003. Rebels belonging to the Islamic Salvation Front will wage their fiercest military campaign against the Algerian government to date. This time the government in Algiers will be overthrown. Coup d'e etat elements within Morocco, supported by newly-formed Islamic fundamentalist states in Tunisia and Algeria, will then attempt the overthrow of the pro-Western Moroccan king, King Mohammed VI . Terrorism will be rampant throughout North Africa and in neighboring France. French troops may even be deployed to Algeria, Tunisia, and Morocco to defend the legitimate governments against the rebel forces. Dated from the Council of Nicaea in 325 AD (325 + 1670), this event should have occurred in 1995; however, we can forgive our prophet if he is off in his calculations by a factor of five or ten years: 1995 is reasonably close to the 2000-2006 time frame considering the fact that the year was arrived at in 1555.
or Iraqi Scud Missile Attacks? NEW PREDICTION: 12/11/02 -- A powerful vector is established in February/March 2003, especially beginning late February. A wave of terrorist bombings may trigger another period of "war" between Israel and the Palestinians similar to what occurred in March and April of last year following the Passover Massacre, only much worse. Initial casualties may reach as high as 60 dead and scores more wounded from one bombing alone. Tel Aviv and Jerusalem will be the likeliest targets. This war will open up a northern front and evolve into a conflict between Israel, Lebanon, and Syria in April (see Israel Invades Lebanon, Wars With Syria). Alternatively, this vector may be the time when Saddam will lash out against Israel, first with conventionally-armed Scud missiles, then later with armed chemical or biological warheads. This will obviously be in retaliation for a US invasion of Iraq. 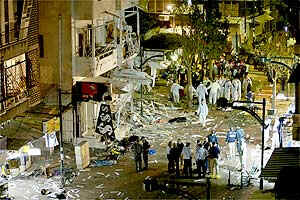 "January 5, 2003 - Two Palestinian suicide bombers strike in crowded Tel Aviv shopping district. 23 murdered, including 8 foreign nationals. More than 120 injured." Worst attack of 2003. Fatalities quite high, although less than projected; but number of injuries much greater. The attack was the deadliest since March 2002, when the bombing of a hotel dining room during a Passover seder killed 29 Israelis and wounded 140 (Passover Massacre). As specified in prediction. A twin bombing. Tel Aviv, one of the two potential cities identified. A month premature, but very close to the February/March 2003 vector. However, unlike 2002, full-scale war does not erupt between Israel and the Palestinians and later against Hezbollah in Lebanon. 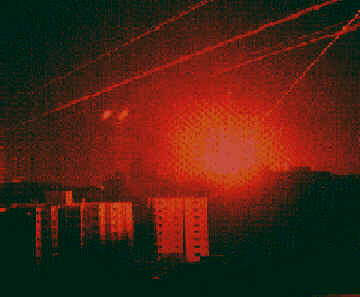 There is one night of major missile strikes in Gaza in retaliation .. and nothing more. 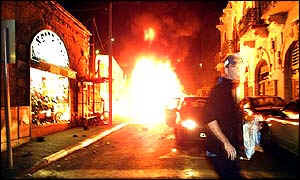 BBC: Carnage on Tel Aviv streets - January 5, 2003. Persia" aka Nostradamus' "The Persian"
NEW PREDICTION: 9/13/02 -- A popular uprising against the mullah-controlled, fundamentalist regime will begin around February/March 2003. 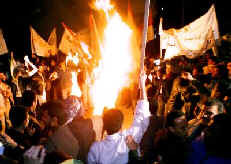 After what appears to be significant gains initially, the revolution will end badly with many Iranian civilians being killed by government forces around June 2003. The fate of the secular President Mohammad Khatami is unknown. If he is a part of the revolt, he will be killed or overthrown by the spiritual leadership; if not, he will remain in power. If Khatami is replaced, a new man will come to power at this time, installed by the current fundamentalist regime or by another far worse. He will fulfill the prophecy of Daniel's "fourth king of Persia" and Nostradamus' "Perse." TEHRAN, Iran (AP) -- Vigilantes on motorcycles chased down protesters and beat them with cattle prods Friday as anti-government demonstrations in Tehran exploded in street battles. In some parts of Tehran, pro-government thugs circled knots of student protesters, gunning their motorcycle engines. Some of the demonstrators fought back, punching the attackers and setting their motorcycles on fire. At times, riot police prevented the vigilantes from confronting the students. Other times, police rushed the protesters themselves, sending them fleeing into the darkness. The violence subsided by daybreak. It was the third night of demonstrations against Iran's hard-line clerics, who are locked in a power struggle with reformist President Mohammad Khatami. Hundreds of young Iranians, many in their teens, have taken to the streets around Tehran University and the Intercontinental Hotel to denounce the country's supreme leader, hard-liner Ayatollah Ali Khamenei. Thousands of people looked on, sometimes clapping with the protesters and taking up their chants. Residents near the university hospital left their doors open so that demonstrators could find quick shelter if the authorities moved in. Traffic was bumper-to-bumper in downtown Tehran until the early hours of the morning as curious residents stayed out to watch developments. 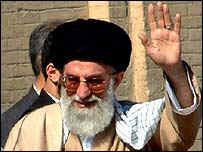 Khamenei warned of a major crackdown in a speech broadcast on state television and radio Thursday. He referred to violence in 1999, when security forces and extremist supporters of hard-line clerics attacked pro-democracy demonstrators after a student hostel was stormed. The raid on the hostel led to the death of at least one student and generated the worst street battles since the 1979 Islamic Revolution. "If the Iranian nation decides to deal with the (current) rioters, it will do so in the way it dealt with it on July 14, 1999,'' Khamenei said. "It should not be allowed that a group of people contaminate society and universities with riots and insecurity, and then attribute it to the pious youth,'' he said. Some protesters have vowed to continue demonstrating until next month's anniversary of the 1999 protests. Reformist newspapers, which reflect the thinking of liberal politicians who have been fighting for change, offered little commentary on the unrest. Exiled opposition groups have been encouraging dissent in Iran through U.S.-based Persian language TV channels. U.S. pressure on Iran, which Washington accuses of hiding a nuclear weapons program and harboring terrorists, may have further emboldened those who hope to see the regime toppled. This week's demonstrators have also called for the resignation of President Khatami, accusing him of not pushing hard enough for democratic reforms. Khatami does not have the support of the hard-liners who control the judiciary, the security forces and other unelected bodies. But the hard-liners do not enjoy popular support, leaving the two sides of government in a stalemate. Ayatollah Khamenei has mobilized thousands of vigilantes armed with Kalashnikov assault rifles and wearing bullet-proof vests to Teheran University where rioting is in its fifth day. Despite reports Friday that the protests had been contained, the student uprising has now spread to two additional cities. [Gunshots were heard early Monday, Reuters reported. "I heard three gunshots quite clearly," a Reuters correspondent at the scene said. "Immediately after the gunshots some of these hard-liners jumped on their motorbikes and headed in the direction of the (sound of the) shots." The crackdown order has been viewed as an act of desperation. The mullahs who inherited Ayatollah Khomeini's 1979 revolution, have been under mounting pressure since the fall of the Iraqi regime of Saddam Hussein. Determined protesters are demonstrating against the Khamenei regime as well as President Mohammed Khatami who ran on a reform ticket but is increasingly viewed as a foil for the ruling mullahs. After reports Friday that the crackdown had succeed in limiting the demonstrations to Teheran University, anti-regime demonstrations have now spread to the cities of Isfahan and Shiraz. Student organizers said clashes between police and demonstrators continued overnight Sunday. On Wednesday, Khamenei officially ordered his security forces not to to suppress the rioting. Basij members undergo military training and many of them have been equipped with motorcycles to pursue and assault suspected student protesters. "Leaders do not have the right to have any pity whatsoever for the mercenaries of the enemy," Iranian supreme leader Ali Khamenei said in a television broadcast on Thursday. "If the Iranian nation decides to deal with the rioters, it will do so in the way it dealt with it on July 14, 1999." "Khamenei has lost his equillibrium and control and does not know what to do," said Assad Homayoun who heads the Washington, D.C. foundation, Azadegan. "Also he is not sure the armed forces will continue to support him. The situation is similar to that in Romania in which the armed forces suddenly changed loyalties and took the people's side. This scenario may repeat itself in Iran ..."
For more on the article, go to Gunshots heard in Teheran as rioting spreads to three cities - June 15, 2003. COMMENT (6/13/03): I consider the "democratic revolution" part of this prediction PARTIALLY FULFILLED, although these demonstrations began during the month I said they would end. Unlike the protests of late last year, these have actually called for the violent overthrow of the spiritual leadership of Ayatollah Ali Khamenei and President Mohammad Khatami. Only in their third day, the current demonstrations have already eclipsed those held last November and are being compared to those that took place in July 1999. Already the uprising has turned violent, as I warned, and Khamenei is preparing Iranian armed forces to quell the revolt in a Tiananmen Square -type showdown. This aspect of the prediction will be completely fulfilled if the demonstrations drag on and become characterised as a "revolution." The second aspect of this prediction will be partially fulfilled if there is a change in the regime, more so if that change brings about a worse dictatorship than what is in currently in place, and completely fulfilled if the new dictator becomes an "antichrist" who wages war on the West, Israel, and pro-Western Moslem states. COMMENT (6/15/03): It is becoming clearer that this is taking on the characteristics of a "revolution," especially when analogies are being made between the demonstrations in Iran and the revolution that occurred in Romania in December 1989. Still, only PARTIALLY FULFILLED (maybe around 75%) regarding the revolution part of the prediction, but nearing 100%. Iran's Khatami offers to quit - July 12, 2003. Pitched street battle in Iran - July 9, 2003. Tehran jammed by protesters - July 9, 2003. Al Qaeda said to have migrated to Iran - July 6, 2003. Iran Student Leaders Say Crisis Deepening - June 28, 2003. Protest over Iran student arrests - June 28, 2003. Four Iranian MPs launch sit-in - June 28, 2003. Iran students say hundred being held - June 22, 2003. Open letter to the free people of the world from Iranian students -- The Mullahs hijacked a nation and took its population hostage under the sham of their perverted brand of Islam - June 22, 2003. 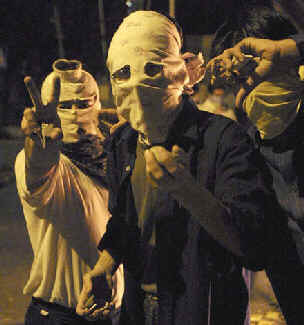 Iran Students Warn Clerics Over Protest Crackdown - June 22, 2003. Cleric urges death for protestors - June 20, 2003. Iranian fire protests in Paris, London - June 19, 2003. Protests spread beyond Tehran - June 17, 2003. Iran dissidents raise their voices - June 15, 2003. 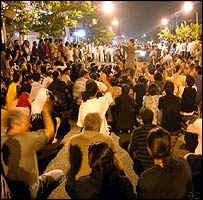 Tehran sees fifth night of protest - June 15, 2003. Iranians in Traffic Jam Protests for Democracy - June 14, 2003. Protests continue to rock Tehran - June 14, 2003. Militia attack Tehran protesters - June 13, 2003. 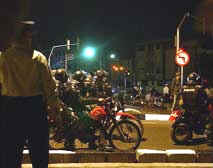 Regime change or bust: Riots at Teheran U worst since 1999 - June 13, 2003. 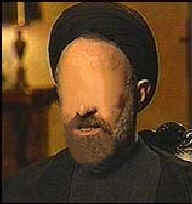 Ayatollah warns Iran protesters - June 12, 2003. Thousands of Iranians protest for second night against country's Islamic rulers - June 11, 2003. Iranian Demonstrations Continue Demanding Change - June 11, 2003. Iranians protest against clerics - June 10, 2003. NOTES: Well, I have just seen a TV documentary that showed last year's popular uprising against Ayatollah Khamenei's regime in Iran. I was quite shocked by the magnitude of the event. For me it had largely been a series of Internet news reports. But, of course, our cable television company does not carry CNN International, only the regular CNN and CNN Headline News. To me it looked almost as big as the student democratic revolution in China in 1989 (which regular CNN did report -- why is regular CNN so crappy now?). Anyway, thank God, the government crackdown was not nearly as horrible as it was at Tiananmen Square, but it was brutal enough. It all happened in June and July. I gave February/March 2003 as the time dissent would begin and June 2003 as the date it would reach a head. Technically, I was correct about when things would reach a head (June), although it was actually a bit earlier than February (November 2002) when dissent began in the form of a smaller series of demonstrations. I don't know how many of the links above still work, but those that do will help provide supplemental information to the two news stories posted above that confirm the veracity of my prediction: "Thousands in Tehran street battle -- 'Khamenei, the traitor, must be hanged!'" and "Gunshots heard in Teheran as rioting spreads to three cities." It is my hope to eventually download software that will allow me to create slideshows I can insert right below each prediction that is fulfilled rather than to just paste a news story or two. It is too bad I can't use my MS 95 PowerPoint to create online slideshows (I thought that when I upgraded to Windows 98 I would be able to use it for the web, but no). Regarding the rest, I said if President Khatami was part of the revolt, he would be killed or overthrown by the mullahs, and if he wasn't he would stay in power. He wasn't and he remains in power. Because of this, the "Perse" did not emerge and take control of Iran (which is a good thing for the people of Iran and the people of the world). So, while my prediction was obviously FULFILLED, it looks like the prophecies of old Nostradamus, Daniel, and Rigord of St. Denis will have to wait until a later time. Of course, it still remains possible that an even larger series of demonstrations could occur as the 2004 elections approach in Iran. But let us hope, instead of the "Perse," that what will result is a much more free nation. NEW PREDICTION: 9/13/02 -- The identity of this person is unknown. He or she will die from a drug overdose or from natural causes in March 2003. It will be quite sudden and unexpected. (CNN) -- Actor and comedian John Ritter has died unexpectedly after he was rushed to the hospital for a "dissection of the aorta," his publicist Lisa Kasteler told CNN. Ritter, who would have turned 55 next week, was the star of the ABC series "8 Simple Rules for Dating My Teenage Daughter." In a statement, Kasteler said Ritter was rushed to the hospital after suffering from an unrecognized and undetected flaw in his aorta. Surgeons at the hospital tried to save the Emmy Award-winning actor but were unable to do so, the statement said. WebMD.com described an aortic dissection as "an abnormal separation of tissues within the walls of the aorta" caused by high blood pressure, family history of the condition, disease of connective tissue, or severe trauma to the chest. "Aortic dissection results in a weakened blood vessel wall that may also rupture," the Web site says. Ritter was best known for his role as Jack Tripper on the long-running television sitcom, "Three's Company." He was the youngest son of Western film star and country music legend Tex Ritter, according to his biography on ABC's Web site. 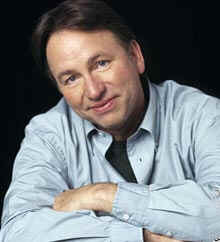 John Ritter was born on September 17, 1948. He is survived by his wife, Amy Yasbeck, and their daughter, Stella, and three children -- Carly, Tyler and Jason -- from his first marriage to Nancy Morgan. COMMENT (9/12/03): This is truly a dreadful shock. I can't believe it ... I don't want to believe it. It's like a nightmare ... I wish I could say it wasn't true. I hate to say this, and don't like having to say it, but, this was a PREDICTION FULFILLED .. and more so in this instance than in the case of Nell Carter or certainly Merlin Santana (who I never heard of). This is a personal shock to me and it takes a lot to bother me these days where the death of a celebrity is concerned. A lot of people are going to miss you, John. Sorry you had to end up on this page of all places. 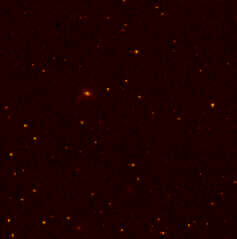 A Major Comet or Planet Nibiru? NEW PREDICTION: 1/21/02 -- March 2003 will mark the seventh anniversary of the passing of Comet Hyakutake. The ancient space visitor, wholly unanticipated, came from far beyond our solar system. The greenish, ghostly apparition was visible in the Northern Hemisphere all night long each night for over two weeks in March 1996, reaching its brightest point on March 23. There was little time to prepare, since it was only discovered in late January. Yes, it is true I dote on comets. I predicted none for 1998 and 1999, but I have predicted a visible comet for every year since 2000. The base 7 system revealed that 2000 was the 35th anniversary of Comet Ikeya-Seki, one of the most spectacular comets of the 20th Century. Thus, in 2000 we had Comet LINEAR S4 -- "the exploding comet" which reached magnitude 4.5 before it blew up, causing a sensation in July. Yet it was relatively dim to the naked eye. Whilst it was true that 2000 marked the 35th anniversary of Ikeya-Seki, it also marked the 14th anniversary of Comet Halley's feeble appearance in April 1986. Thus, LINEAR S4 was both a poor show and a spectacular media event. 2001 was the 14th anniversary of the last visible supernova (visible in the Southern Hemisphere in 1987), the name of which escapes me at this writing. Would there be a supernova or a comet? -- I wasn't sure which so I predicted either might happen. In May 2001, wholly unanticipated by astronomers who thought it would never do better than a magnitude 11, suddenly Comet LINEAR A2 went into a series of outbursts which quickly brought it to the edge of naked eye visibility. In small telescopes and binoculars the "double comet" looked like a pair of headlights in fog and appeared as a small blueish object with a short tail to the naked eye in very dark skies. It was largely a Southern Hemisphere spectacle, reaching magnitude 3.0 at its brightest. Before it faded from view in August, two distinct tails could be seen. December 2001-February 2002 was the 28th anniversary of Comet Kohoutek, a comet that had a good shot at being a major comet in the winter of 1973-74, but did not live up to expectations. This time, I gambled that things would be different and the gamble paid off -- not once, but twice! In the Southern Hemisphere Comet LINEAR WM1 went into outburst and flared to a magnificent magnitude 2.3 apparition. Unfortunately, as with LINEAR A2, WM1 faded as it moved back into the Northern Hemisphere. However, another comet, Ikeya-Zhang, made up for it, becoming a modest but spectacular naked eye apparition in March and April low in the western skies after sunset in the Northern Hemisphere. 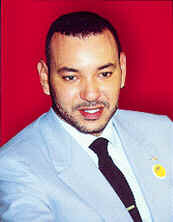 Visit my Comet Prophecy and Year 2001 (Part Two) pages for more details. It would normally be insane to expect a comet visible to the naked eye to appear every year for three years in a row, let alone four or five (as I am again predicting comets for 2003 and 2004). Those of you who are familiar with my system know that events do not normally line up in this way. Nevertheless, we have had a naked eye comet three years in a row, albeit not very bright naked eye comets. Astronomers would tell you that this is still quite unusual. Once or twice in a decade, on average, does a comet reach the visible range for humans, often just barely. However, the prophecies of Nostradamus warn of "bearded" or "hairy" stars, blazing torches, fireballs dragging a tail of sparks, and a great star that will burn for seven days when the Pope must flee Rome. In nearly every case, these comets are connected with major wars or global wars. In one case, a comet is linked with the opening years of the new millennium. There are also the Hopi Indian Blue Star Kachina and the Marian visions of the "two colliding stars" and the "ball of redemption." Likewise, when the latter years begin, Jesus warned of "wonders in the heavens." I believe the final age of humanity has commenced -- a rather lengthy age of 240 years, but final nonetheless. Because I anticipated a time of great war beginning in 2001 and because this is the new millennium, I have felt that a base 7 anniversary of any past celestial spectacle a potential year for one of these comets. 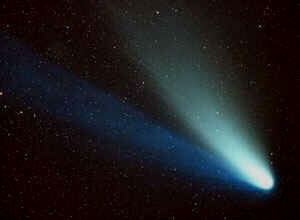 Although the 2000 and 2001 LINEAR comets have not fulfilled prophecy, they are certainly harbingers of what is to come. I have been having recurring dreams for many years of strange sights in the heavens. Streaming, red-feathered serpents at war with what appear to be classic, saucer-shaped UFOs. "Artificial" comets, meteors, and swirling "galaxies" that appear to be created purely for amusement. Huge advertising satellites that function as space billboards and satellites that turn night into day. Traveling effortlessly about on a contraption that very much resembles the unveiled, two-wheeled "it" -- due to be marketed in 2003 -- whilst looking up at a streaming comet during sunset. A strange red comet that I could see during daylight. And many disturbing dreams of what looks like another moon -- only the light is very faint like red rust or a deep purple. The more vivid and repetitive dreams, if fulfilled, tend to do so within a space of three to eight years, sometimes much less (as little as "immediately" or a few months), sometimes ten years or more. Of course there is no doubt in my mind that some things I see that are prophetic will not happen in our lifetimes -- like the space billboards and artificial celestial wonders -- they are just not a part of our current frame of reference nor likely to be anytime soon. What has been most repetitive since 1995 (although I am aware of dreaming of it long before then) are the dreams of a false, second moon. These are startling, disquieting, even alarming. Now I finally have a context for these dreams and what they may mean. I am calling for a major naked-eye comet appearing in March 2003. Even so, I am very aware of the fact that Spring 2003 is the projected period for the passing near earth of Nibiru, also called Planet X. Therefore, the influence of ancient Hyakutake's 1996 return may instead herald the return of this brown dwarf star, this giant companion from the distant edge of our solar system, which ancient lore has said brought great death and destruction to earth in past times and prophesy that it shall once again. Conspiracy theories are things I have generally tried to avoid -- especially after having been once bitten. 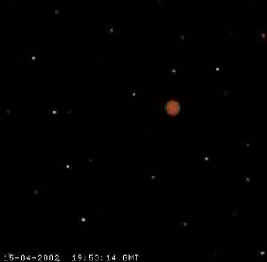 When I first got on the Internet, I read about Comet Lee, the comet alleged to be seen during the 1999 solar eclipse. I resisted that myth. However, I nearly dared to plunge this web site into a tailspin when the Mars-struck-by-a-comet cover-up began on June 6, 2000. I nearly swallowed the whole thing, sinker and all, including the prophecy of Phobos sneaking up behind us and crashing into our planet. Thankfully, I did not cave in and inundate these pages with such rubbish. The object which many believe to be Nibiru has been designated as 2001 KX76 and classified as a large "Kuiper Belt Object." Estimates of its size vary -- from smaller than our moon to the size of Jupiter. The colour has also been altered in later plates from the original red to blue by filters, say conspiracy buffs who insist this is a way to cover up the discovery and confuse an inquiring public that wants to know. I first learned of Nibiru last year from a regular viewer to my site who goes by the name of YUSUF. He projected that it might pass the earth on October 12, 2002, destroying the planet Mercury and Venus, causing fiery debris to rain down upon earth. This projection is not shared by Nibiru enthusiasts who believe it will not arrive until around May 2003. However, as to the destructive element, many of them agree that it will bring horrendous earth changes so terrible that only a few hundred million to a billion people will survive. This, I suppose, will depend on how closely it passes. Those who cite Bible prophecy claim Nibiru is the star Wormwood prophesied in Revelation which destroys a third of humanity and animal life -- particularly marine life. What is Nibiru? 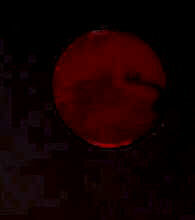 A brown dwarf star, say Planet X believers. This is a normal-sized star like our Sun or larger that, in its death throes, collapsed inside itself, shrinking to an object the size of Jupiter or perhaps several times the size of earth. It is very dense and has a tremendous gravitational pull -- the same it would have as a normal-sized star. Although it is called a brown dwarf, the colour is actually red -- a very faint rusty red since the light barely escapes its gravity and its reflective capability is likewise greatly diminished. It is almost a "stealth star." It is called a "death star" because any planet it passes is partially destroyed by its gravitational force and an ensuing tug-of-war. And it need not be very close, either, before all hell begins to break loose. If Nibiru is real, we will experience an unusual number of volcanic eruptions, floods, earthquakes, and destructive weather before we even see it. Experts in this field say we will have between 6 and 16 weeks to view the dwarf star before it destroys most life and nearly every trace of civilisation on earth during a major shift of the earth's axis. Do I believe it? I don't know at this point, but if it comes it will certainly fulfill my prediction, somewhat belatedly, of the global destruction that attends the opening of the sixth seal which I projected for July 2001. It will also fulfill my dream of a red comet whose arrival is long-awaited and warned of in ancient prophecy and my dreams of a phantom planet or moon that just "shouldn't be there" but is. It is my sincere hope that March 2003 will instead bring a marvelous and beautiful comet, as great or greater than Comet Hale-Bopp, and I can ride the new invention "it" into a rosy sunset, stopping now and then to admire the sight as twilight settles. This too is a powerful dream I have had -- yet who can say what it is I am seeing and admiring? It could be Nibiru, after all. For more on my red comet dream visit the The Comet Prophecy. To see my red comet and potentially Nibiru-related dreams, open a Dream Window. Catherine and Tonya also share their vivid dreams of Nibiru in this window. In one, planet Mercury is swallowed and destroyed while war rages in the Middle East! Also, a new vision of an impact by a large meteor or small asteroid and a subsequent Nibiru revelation by Chris and two very similar planetoid dreams by Laura and Tonya. UPDATE (4/2/03): Anonymous has a dream about Australia being struck by the dragon's tail! According to experts, Nibiru will rise in the east to the left our sun. In my dreams I have seen it very high in the eastern sky during daylight hours. It is definitely not a comet when I see it like that -- it is a round object, red in the centre surrounded by white -- something like a hard-boiled egg with a distinctive red yolk. It is unlike anything I have ever seen in the daytime sky or could ever imagine. Some artwork I have seen, like the now-famous artist's rendering above, comes very close to capturing my vision, but in my case the object is much higher in the sky and it is broad daylight, not sunrise or sunset. The following ancient Chinese prophecy deals with a red star rising in the east. The hour of rebellion is not yet, but will come with a manifestation from heaven, this shall be a red star in the east. For at that hour the man will appear, and on that day from all the fields of the Empire shall rise up those sown of the dragon's teeth: Then will the silence of the ages be broken, labyrinths uncoil, and a murmur come from depths so deep and unknown that even the world itself shall shrink with dread. The sky suddenly turned back to a liquid and then turned blood red. As far as his eyes could see, the sky was solid red, with no variation in shadow, texture or light... As sunset drifted to night, the stars shone red, the color never leaving the sky, and everywhere was heard the cries of fear and pain. From this time, when the stars bleed, to the fourth and final sign will be four seasons of peace. It is in these four seasons that the children of the Earth must live deep in the wild places and find a new home, close to the Earth and the Creator. It is only the children of the Earth who will survive, and they must live the philosophy of the Earth, never returning to the thinking of man. And survival will not be enough, for the children of the Earth must also live close to the spirit. So tell them not to hesitate if and when this third sign becomes manifest in the stars, for there are but four seasons to escape. I have spoken to you of the BALL OF REDEMPTION to meet with much speculation from souls, I shall explain now, how this will come about: The ball will descend from the atmosphere of your earth: it will be from the heavens; it will not be man-made; it will be part of the universe. YOU WILL BE PLANET STRUCK! In this chastisement, My children, billions will be lost. Many lives will be lost. You bring upon yourself a punishment far greater than ever has been seen upon earth and never shall be seen again, for when you go through this chastisement, there will be few creatures left upon earth. Can you not understand that when the Ball of Redemption is sent upon you three-quarters of your world shall be gone? What could cause these horrific prophecies to come true? Could this be related to the ancient prophecy from Sumerian, Babylonian, and Hebrew times -- about a "12th planet," a "red comet" to the Hebrews of Exodus, "a red star" to ancient Chinese prophets, Planet X to us, Marduk to the Babylonians, Nibiru to the Sumerians, and Wormwood to the Bible prophet St. John? Is the "Ball of Redemption" a planet four times the size of earth and 30 times as dense or is it a brown dwarf star -- a sun that collapsed inwardly, a dark star that has tremendous gravitational influence on everything that it passes, a death star. This object has been discovered and re-discovered by astronomers since 1982 and reported about as recently as July 2001 ... and the governments of earth have allegedly done their best to conceal its existence through a program of disinformation. According to experts on the subject of Nibiru, in early March 2003 everyone will know about it because it will be viewable to the naked eye. Between May 15 and May 25 it will come close to earth, causing it to stop in its rotation for three days. Then, in the space of one hour, the earth will shift 90 degrees. During that one hour billions will die. Estimates are that as few as 600,000,000 people will survive. Many will die before that even .. from the many earth changes experts say will occur between now and May 2003. The volcanic eruption in the Congo may only be the beginning. Nibiru, it seems, has a long reach and will cause many earthquakes, volcanic eruptions, deluges, forest fires, and super hurricanes even before it is seen. Phenomena that will be blamed on El Nino, sunspots, and other mundane explanations. 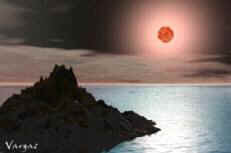 Of course there are some experts who disagree and say Nibiru will not arrive until 2012 ... some later than that. The United States has not been the only nation with a keen interest in keeping tabs on Planet X since its discovery in 1982. Russia has also been watching the skies. On the CyberSpace Orbit website, on page http://www.cyberspaceorbit.com/gimp_norlok.html, a Russian astronomer named Oleg Mandurek has shown photos, allegedly of Planet X itself, taken by the Russian space probe NORLOCK in 1996, 1997, and 1998. At right is one of the colour photos purportedly taken of the brown dwarf star. Russia's Parliamentary leaders and President Vladimir Putin agreed Wednesday to embark on a three-year crash course to thwart what they said was an anticipated chain of disasters due to hit the country in 2003. "(These are) issues of extraordinary importance, strategic issues which may degenerate into a serious threat for the existence, I want to stress this, for the existence of Russia," former Prime Minister Yevgeny Primakov told reporters. Boris Gryzlov, leader of the pro-Kremlin Unity faction which was the first to raise the issue, said Russia would also have to deal in 2003 with a massive population shrinkage. Gryzlov said the problems had already been discussed with cabinet ministers and the parliamentarians had agreed with Putin to set up a commission to tackle the issue head-on. "The question was discussed at length and the president approved our initiative and said he would dispatch representatives of his administration to the working group," Gryzlov said after the Kremlin meeting. It is quite possible that many Russians have resigned themselves to the inevitable or else disinformation has been passed along that the coming of Nibiru will be a monumental spectacle rather than a catastrophe. 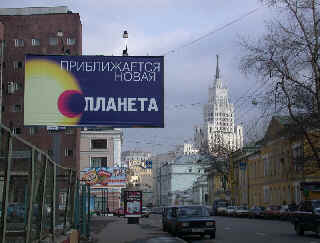 The photo at left was taken in Moscow earlier this year and appears to demonstrate a building sense of anticipation for the arrival of Planet X: the sign reads, "New Planet is approaching.". The question now is, has the recent hostage crisis in Moscow been the beginning of Russia's own campaign to obfuscate the truth about Nibiru by shielding its population with the lesser terror of a major war? The crisis almost certainly will lead to massive Russian military action not only in Chechnya and surrounding enclaves, but also into neighbouring Georgia and possibly further into Turkey or Armenia. Arrests of public officials accused of collaborating with the Chechen hostage-takers, as well as the government's use of a chemical weapons agent against hostages and terrorists alike, is triggering angry protests from the Russian Parliament according to the BBC. Could this be the start of a purposely-engineered coup or civil war? I was going to publish the entire article by Robert Roy Britt, Senior Science Writer, in its entirety on this page. However, it is quite lengthy and space will not permit (unless I want to devote this entire page to Planet X, which I do not). Here is the link: Alleged NASA Cover-up of Menacing 'NEAT' Comet Threat is Pure Bunk, Experts Say. I also have the article downloaded to place on a separate page in the event this link ever goes dead. I do not consider this article as an example of "disinformation." It seems an honestly written piece by an accredited individual. The SPACE.com website is relatively new, only airing for the first time on the Internet last year. It seems to me rather odd that the people there would put so much hard work into a site such as theirs if they really had "secret knowledge" that the majority of earth's population was going to be destroyed by May 2003. I mean, SPACE.com is no "shake n' bake" or "1-2-3" website thrown together in a few minutes -- one can discern such things. SPACE.com has the look and the organisation of information that tells you they intend to be around for the long haul. Therefore, this is a group with integrity. Ergo, since SPACE.com has published this article on their website, clearly they believe Mr Britt is likewise someone of integrity. I believe he has successfully discredited the Comet NEAT conspiracy, but perhaps not entirely succeeded in diffusing the Planet X theory. Read what he has to say and make up your own mind. When I first got on the Internet, the Comet Lee conspiracy was in full swing. I laughed it off, repudiating it on sight, and why not -- I do have a college-educated background in astronomy after all and have personally known and spoken at length with other amateur astronomers over the course of my life (in real time, by the way, not on the Internet). When the Mars/Comet Kohoutek conspiracy followed in June 2000, I was a bit more intrigued, but still unconvinced by the so-called "evidence." One major problem with both of these conspiracies was that the prophecy that was used to support them was so scanty and selective. This, in fact, is often the case with conspiracy buffs who seek to use prophecy to help bolster their theories. Normally, I resist associating one with the other, although conspiracies do make for entertaining reading. However, because so much agreement exists between a large number of various prophecies and actual documentation of a close encounter with Planet X by ancient civilisations such as the Sumerians and Babylonians, and because I regard Immanuel Velikovsky's "Worlds in Collision" theories as having been vindicated by the nature of the discoveries made during space exploration to Venus that he accurately predicted would be found, I thought this particular theory -- the Planet X theory -- had some real teeth. Add to this dreams I experienced of a strange-looking celestial object in both night-time and daytime skies that I could not easily classify as comet or planetoid, well before learning of this Nibiru theory. Something I am bound to take seriously since I have a history of having seen a number of my dreams come true. The prophecies of Nostradamus, the Bible, Mother Shipton, Veronica Lueken, and others do concur that one day we will experience a close encounter with an object from space that will wreak havoc with our planet. Still other prophecies describe catastrophies on this planet that could be consistent with such a close encounter, but do not say what the cause will be. Unfortunately, few of these prophecies offer clues as to the year when this will happen. Based on years of Nostradamus and prophecy research, I did not expect an X-type event to occur before sometime in the 2039-2044 period. A small asteroid collision in the Mediterranean Sea, prophesied by Nostradamus and also in the Book of Revelation, I believed would happen sooner, possibly as early as 2008. But, after being confronted with the very well-organised and well-documented Nibiru theories by Mark Hazlewood and others, I was forced to reconsider the feasability of my conclusions. Perhaps now was the time. Well, perhaps now is not the time. I must warn, however, that even if Planet X is not nearby, something else might be. I believe in what is called "poetic justice" -- a punishment that, by coincidence or perhaps divine intervention, matches the crime or sin committed by the offender who is being punished. It is not impossible that the "Planet X scenario" could still play out by some as-of-yet unknown cosmic invader of our solar system. Chances are this must happen sooner or later, for prophecy assures us it will. If you do not believe in prophecy, then none of this means anything. However, if you do, then it could mean everything. Assuming the Nibiru Buffs are Correct, Will We Be Warned? Will There Be News? According to many Nibiru conspiracy buffs, we will never be informed of the imminent approach of Planet X by our governments or our news services. Do not expect major news updates on Nibiru. News organisations will report the dramatic earth changes that will occur between now and the approach, but will "cover up" the real cause, blaming "El Nino" or "sunspots" or some other reason for the rash of bizarre weather, volcanic eruptions, and seismic events that will unfold. Possibly, during the last 6 weeks before Nibiru reaches earth, we may be told ... and maybe not even then. Then again, in my dream from early last year (see Dream Window), I saw a photograph of it along with a report in a newspaper. Of course by that time it is visible in daylight and hard not to see. June 1, 2003 (10:30 PM EDT) -- As far as I am concerned, the "PX scare" is over. And let's face it, that is exactly what it was, a "scare" created by Nancy Lieder and her Zeta friends and by that opportunistic author who laughed all the way to the bank, Mark Hazlewood. We were all suckers for this grand Internet scam, myself included. And although I always straddled the fence on this issue, playing devil's advocate; it would have been better if I had set an example and ignored the whole thing altogether. For the record it was never the Zetas that had me concerned that this theory might be true. Indeed, if they had been the only ones ranting about PX, I doubt very many people would have believed in all their alien-channeled nonsense. Unfortunately, people with seemingly much better credentials were also hawking this myth, giving the entire scenario a respectable veneer of credibility. Worse, as time passed, some of these same individuals began giving Nancy Lieder and her Zetas a share in their credibility. Well, in this case, the less said the better. I have grown tired of looking at sun dogs, camera flashes, over-exposed photographs, photo manipulations, planets that take on funny shapes if the camera is moving when the shot is taken, and the fairly common event of "anomalies" near the sun seen courtesy of SOHO (these are, for the most part, a certain class of sun-grazing comet that almost always ends up being gobbled up by our nearest star). I'm also tired of trying to figure out why "PX" is to the right of the sun, then to the left, then at bottom, at 5:00 position, at 9:00 position, a distinct distance from the sun in some photos, and so close as to be touching or merging with the sun in others. Like millions of other earthlings, I have seen nothing unusual when I look at the sun nor have I noted anything odd about where it sets or how long the daylight lasts. Somewhere out there a few hundred people are continuing to see and photograph things most of us cannot see for trying, even with welder's glasses and the appropriate viewing equipment. Despite some recent earthquake activity, overall none of it is any more remarkable than the seismic activity of early 2001 or the summer of 1999. Indeed, some years have been much more cataclysmic in terms of earth changes than 2003 has been. To put it bluntly, there is no visual or physical evidence of a Planet X nearby. All visual evidence is phony, whether intentionally or unintentionally so, and as noted above, highly contradictory. There is absolutely no consistency to any of the alleged "sightings." All other "evidence" is coincidental to the projected date of flyby announced by Lieder and Hazlewood. I must add that this does not mean I do not believe in the premise of a Planet X or something like it one day passing planet earth and wreaking great havoc on humanity. There is plenty of prophecy, in my opinion, that seems to support the idea that this scenario or something similar must happen. In addition, scientists have been warning us since the mid 1990s about the possibility that a large asteroid could one day impact the earth, even creating the acronym ELE (Extinction Level Event); so this is nothing new and is an idea we all must live with. But it is clear to me that those who profitted by turning the Planet X theory into an actual prediction complete with set deadlines, along with a lot of survivalist advice, perpetrated a very harmful scam on those unwitting enough to believe ... and obey. So; this is the end. Unless millions of people start seeing something that shouldn't be there or NASA warns the world to prepare for something big and bad coming our way, I am done with this. 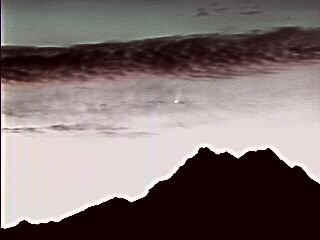 As for the question posed above in the title of this presentation, A Major Comet or Planet Nibiru?, the answer arrived in the form of a naked-eye sunset comet named Comet NEAT V1 in February 2003. See A Naked-Eye Comet for Winter and Spring 2003? below. That was one prediction you could count on. If experts are correct, we will see a barrage of media disinformation and efforts to misdirect the public. These are stories calculated to cover up the real cause of an earthshaking event (blaming arsonists for historic, record-breaking wildfires in the American northwest), distract attention away from Nibiru warnings on the Internet (better start worrying about that asteroid that's going to hit us on February 1, 2019), and disguise the truth as something else (like "emergency cities" being set up by FEMA in the event of mass nuclear or bio-chemical attacks when the real reasons may have more to do with what is coming at us from space). These are some of the examples; there are many other disinformation tactics. This page will deal with unusual geological, meteorological, and astronomical events that may signal that Nibiru's gravitational influence on our planet and our inner solar system is increasing. The unprecedented wildfires in the American northwest and the crumbling of a comet entering the earth's backyard by a "massive unknown force" are examples of this. A Naked-Eye Comet for Winter and Spring 2003? Ok, we have given Nibiru the spotlight for some time now ... even though conclusive evidence that it will be passing us in May 2003 (or later in 2003) still has yet to be produced. Now is time to present the other aspect of this presentation: my prediction that there will be a major naked eye comet in March 2003 -- period. Whether this will prove to be an actual comet or what Planet X theorists say will be a deadly close encounter with a brown dwarf star, I do not know. Perhaps both events will occur in the spring. But I doubt it. I rather think we will either see a spectacular comet like Hale-Bopp or we'll see the frightful apparition of the ancient Sumerian daemon god. HOT COMET: Comet NEAT (C/2002 V1) is approaching the Sun. On Feb. 18th, it will swing past our star at a distance of just 0.1 AU. The planet Mercury, for comparison, lies 0.4 AU from the Sun. SOHO coronagraphs will record the close encounter between Feb. 16th and 20th, so stay tuned! Meanwhile, if you're lucky, you might be able to spot the comet yourself. Look low and to the west around sunset for a fuzzy 2nd magnitude "star" with a long tail. Steve Bodin of Silverdale, Washington, captured this image on Feb. 12th. Comet NEAT is following the Sun as it sinks behind the Olympic mountains of western Washington. COMMENT (2/14/03): That's the way I like it -- short and to the point! There is no question that Comet NEAT V1 is turning out to be the best comet since Hale-Bopp. One measurement of its magnitude actually placed it at 1.5 in Poland! There are still two days left before it gets lost in the sun's glare, and it could well reach 0 or better by that time. Sadly, viewing conditions around my neck of the woods are not so great: a lot of snow and a lot of clouds. That's the breaks, I guess. But maybe tonight or tomorrow, the sky will clear. I don't know what happens to NEAT V1 after it passes the sun. Will it start dimming or will it brighten considerably even more? No one knows for certain. I believe it stays in the northern hemisphere, whatever it does, unlike the other comet, Kudo-Fujikawa, which will become a southern hemisphere object when it becomes visible again. "It is my sincere hope that March 2003 will instead bring a marvelous and beautiful comet, as great or greater than Comet Hale-Bopp, and I can ride the new invention "it" into a rosy sunset, stopping now and then to admire the sight as twilight settles. This too is a powerful dream I have had -- yet who can say what it is I am seeing and admiring? It could be Nibiru, after all." Take a look at the picture. A sunset comet indeed it is. No, I'm not driving "it", but I may still see this celestial twilight sight with my own eyes. And if I can't, there is the photograph above -- looks like a snapshot of my dream! Meantime, let's hope the Nibiru folks are wrong. Check out my March 2001 dream about a sunset comet in the Dream Window . What you will read described is uncannily simlar to this comet (which was still a long way from being discovered, let alone performing). Also look at the photo of Comet West which looks eerily like Comet NEAT! COMMENT: NEAT V1 ranks as the fifth brightest comet since 1935. Hale-Bopp is the third brightest. I wish I could have seen it. 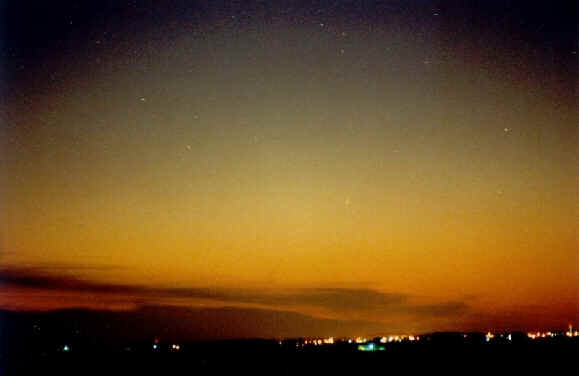 My personal prediction only projected that a bright sunset comet would arrive around March 2003 (which it did). Planet X was a seperate theory by Mark Hazlewood and ZetaTalk which just happened to have a deadline close to my vector for a bright comet. It was a theory that held some potential, so I kept track of it here, just in case those who were promoting it were right ... until the May 15 deadline passed. The accuracy rating below is for my comet prediction only. I never predicted Planet X would arrive in 2003 and those who did failed. NEW PREDICTION: 5/20/02 -- When the Great Comet of 2003, or Nibiru, whichever the case may be, is nearing its closest point to earth, the Chinese dragon will make its long-awaited move to invade and conquer Taiwan. At the same time China invades, it will attack US and US-allied ships in the region. 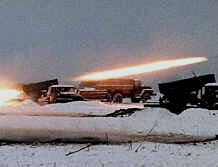 North Korea may also choose this time to invade South Korea. It may also be at this time that China will conquer and occupy India so as to control shipping in the Indian Ocean and on behalf of its ally Pakistan. The entire region will be at war while the horrid apparition of the Great Comet, or worse, the dwarf star Nibiriu, is coursing through the heavens above. The base 7 dating for this event is March 2003. At that point or later in the year (if my read on Irlmaier is correct) "the yellow dragon" may launch a nuclear attack against Alaskan, Canadian, and US west coast cities. By this time Beijing will have MIRVed all 24 of its ICBMs and possibly some of its sub-launched tactical medium-range missiles. As many as 100 or more cities throughout the Pacific could be in danger of attack. Placing the great Ocean into terror. The greatest ocean in the world is the Pacific. Of the two "red" or communist East Asian adversaries, China is the most powerful and dangerous. Following months of massive air strikes and a naval battles with the US, its Pacific allies, and with India, China will lash out in fear at its enemies with part of its nuclear arsenal. The base 7 dating places this event around August-October 2003. China will have a deadly ICBM capability, placing many US cities in peril. Major cities in Japan, New Zealand, Australia, India, the Philippines, and others may also face potential destruction -- including all other countries that are in dispute with China over control of the Spratleys. For possible visions by me relating to a Sino-US war and a global plague, war with North Korea, the horrific destruction of US aircraft carriers and battleships in the Pacific, the shooting down of enemy planes, long-range nuclear missile attacks against the Western US while war rages in the Middle East, and more, open Dream Window 11. There is also a time line of events in the Master Dream Window where this conflict might be plotted. North Korea wants the United States to sign a non-aggression treaty, and has accused it of pushing the Korean Peninsula to the brink of nuclear war. Washington says it will not reopen official talks with the North until it halts it nuclear programs." It should be emphasized that there is the possibility, though remote, that North Korea and its leaders will not simply wait for the United States to take action. There is the possibility that the DPRK leadership would opt to preempt the United States, resorting to military or aggressive action in an effort to secure a better negotiating position. As a significant number of North Korean forces are forward deployed close to the DMZ accurately determining a warning of war may prove impossible. The setting of the countdown clock was intended to focus attention on the increased tensions on the Korean Peninsula. As such, the current setting of the clock is intended to focus attention on political and diplomatic considerations notably with regards to the United Nations, South Korea, Japan, and other US allies ..."
Note that, thus far, the greatest threat of war between North Korea and the United States occurred during the second quarter of 2003, quite close to my March 2003 projection. The vector is also only five months removed from the beginning of the continuing crisis. Whether or not war ultimately results, this aspect of the prediction must be considered as either a very CLOSE CALL or PARTIALLY FULFILLED, depending on what happens and when. The North Korean nuclear crisis began in the major news media on October 17, 2002. For complete news regarding this developing threat, from late October 2002 on, go to China Emergency Info Window. On 06 September 2003, a crowd of 150,000 people marched in the streets of Taipei -- the largest demonstration Taipei had ever seen -- to demand that government agencies, companies, and private institutions which use "China" in their names replace it with "Taiwan." On 19 November 2003, China delivered an unusually harsh message to Taiwan's leaders, warning it will use force if the island pursues independence from the mainland. Wang Zaixi, vice-minister of the Chinese cabinet's Taiwan Affairs Office, said that Taiwanese President Chen Shui-bian's "extreme" push for independence is running the risk of triggering a war. The remarks were the strongest yet in an ongoing war of words that has been escalating recently as Taiwan's March presidential elections drew closer. Chinese Premier Wen Jiabao warned that China will not accept any move toward independence by Taiwan ... With Taipei veering away from reunification, Beijing views the possibility of military confrontation as real ..."
"Although it is unlikely that China would initiate the use of weapons of mass destruction in the context of a conventional invasion of Taiwan, it is quite possible that Taiwan would initiate the use of chemical weapons in response to such an invasion in the event that a purely conventional military response appeared inadequate. 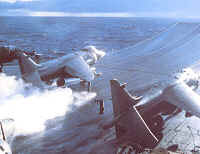 In any event, if Beijing's amphibious assault did not spontaneously collapse, such an invasion would almost certainly provoke an American intervention sufficient to terminate hostilities on terms unfavorable to Beijing ..."
Note that, thus far, the greatest threat of war between China and Taiwan, with potential for United States intervention, occurred during the March 2004 election when US aircraft carriers were deployed to the region. The crisis began in September-November 2003, six months following my March 2003 projection and within the second August-October 2003 vector. The second vector is also, in turn, only five months removed from the tense March 2004 election. Whether or not war ultimately results, this aspect of the prediction must also be considered as either a very CLOSE CALL or PARTIALLY FULFILLED, depending on what happens and when. The Taiwan crisis began in the major news media on October 27, 2002. For complete news regarding this developing threat, from late October 2002 on, go to China Emergency Info Window. President Bush came very close to actually launching an attack on North Korea in the spring of 2003. In March the U.S. moved a fleet of ships to the region, including the aircraft carrier USS Carl Vinson with its 75 aircraft. In preparation for the attack, 6 F-117 Stealth bombers were sent to South Korea and 25 F-15 Fighters and 24 B-1 and B-52 bombers were stationed in Guam. Plans to conduct air strikes were in place, Bush admitted to South Korean Foreign Affairs and Trade Minister Pan Ki-Mun one year later. The danger of war was averted during the U.S.-South Korean summit in Washington in May 2003, when South Korean officials strenuously objected to the plan. As in 1994, the American public never knew just how close the U.S. came to war on the Korean Peninsula in 2003. South Korean opposition to military action only strengthened the Bush Administrations conviction that it would be necessary to demonstrate the futility of negotiations before it could win the support of regional allies. It felt it could best accomplish that goal by presenting an image of negotiating without actually doing so. COMMENT (12/21/04): PREDICTION AVERTED. As I have warned in the past, sometimes we may not know if a prediction was fulfilled or nearly fulfilled until several years later or longer ... maybe never in some cases. What is unnerving is just how accurate I really was: March 2003, right spot on. But only now can I claim credit because "the American public never knew just how close the U.S. came to war on the Korean Peninsula in 2003." Of course, any war with North Korea would have become a war with China. This closes the book on this vector ... but not the crises which may still result in a Pacific war. 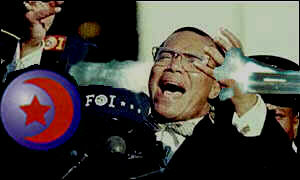 NEW PREDICTION: 6/6/02 -- Nation of Islam leader, Minister Louis Farrakhan, will be in danger of assassination within days of leading yet another "million man march." This may follow an unpopular visit by Farrakhan with a leader who is believed to be connected to international terrorism. Perhaps, too, Farrakhan will become an outspoken opponent of the war on terrorism or, especially, a US war against Saddam Hussein. These actions will stir up anger among some Americans and will likely "set off" an unstable personality. The vector of most extreme danger is April 2003.